Can “Paycheck Equity” be Mandated? For decades, one of the most salient features of women’s status in the labor market was their tendency to work in a fairly small number of relatively low-paying, predominantly female jobs. That has changed and as it has differences in aggregate average wages between men and women (the most often cited data on the “wage gap”) have narrowed. Still, the aggregate average wages of women are almost 20 percent lower than the aggregate average for men. But that data say almost nothing about whether employers compensate men and women in similar positions differently. Only a thin veneer of empiricism covers what seems to me to be fundamentally ideological arguments in the public debate on what, if anything, government should do to address the gender wage gap issue. Proponents of “paycheck equity” measures don’t often acknowledge that research shows that differences in labor force participation, occupation, experience, etc. account for the majority of the difference between the average wages of men and women. While those who believe markets (including labor markets) operate perfectly, and who reject almost all government interjections into markets, fail to note that even accounting for differences in occupations etc., there is still a significant portion of the pay differences between men and women that is unaccounted for or “unexplained.” The unexplained portion of the wage gap is probably 8 percent or less and whether this difference in wages is the result of biases or discrimination that can be remedied by legislation is the fundamental public policy at issue. 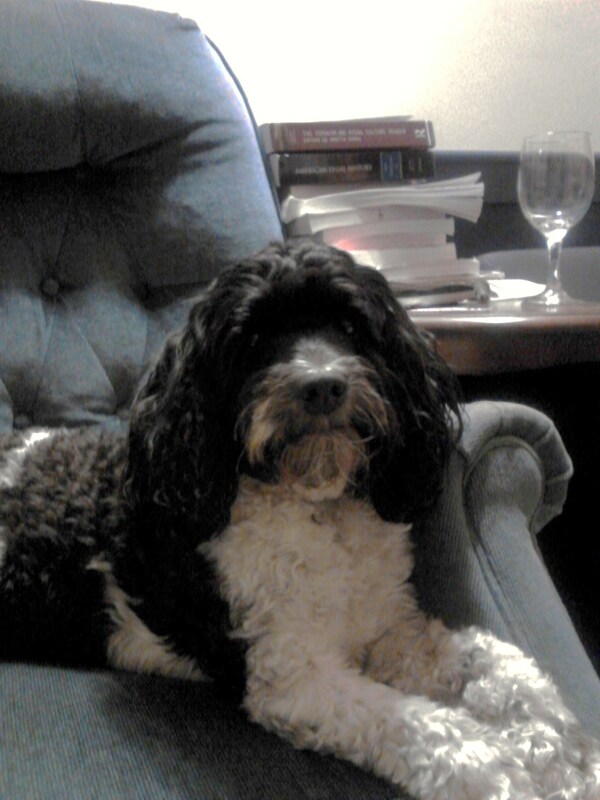 Living with four, smart, talented, women with strong opinions makes me approach this subject with trepidation. It is possible that one or more of them may talk to me even less than they do now (I am comforted knowing that it gets incrementally more difficult for this to occur as the amount approaches zero) if my interpretation of the issue is in error in their eyes. Still, as the father of daughters, I want to know if there are any biases in the labor market that may constrain their earnings and limit their ability to care for me in my dotage. To truly know whether biases or discrimination (intentional or not) contribute to the wage gap you have to do the impossible, you have to compare the wages of men and women with identical ages, education, qualifications, experience, motivations, work habits etc., in identical jobs, working for identical companies, and you have to do it for the entire male and female workforce (across all occupations). 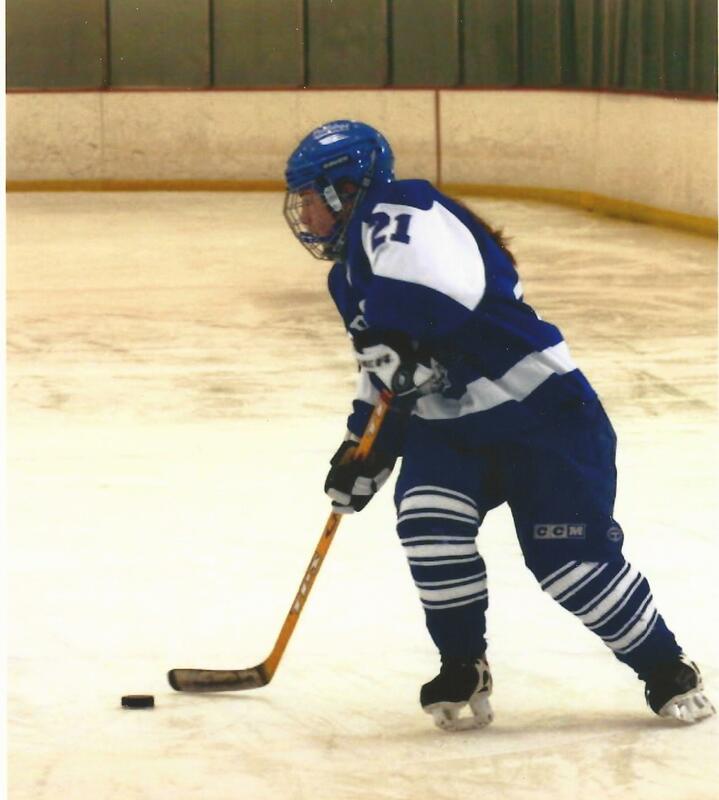 Nobody can do that so in the absence of a Boston Celtics, Boston Bruins, or UNH hockey game on television this past Saturday evening I undertook a smaller task to gain the kind of first-hand insight into the issue that only analyzing data can provide. My goal was to compare the wages and salaries of full-time working men and women who are as similar in education, age, experience, occupation and other factors (marriage, children etc.) as possible, to see if wage and salary difference exist when as many key characteristics of individuals are as similar as possible. The 2009 March Supplement of the U.S. Census Bureau’s “Current Population Survey” contains information on the college majors of those who have earned degrees, in addition to the usual labor force, earnings, and demographic information it provides about survey respondents. I extracted microdata for over 5,000 survey respondents nationally whose highest educational attainment was a bachelor’s degree in accounting and who were employed full-time as accountants or auditors. Focusing on just one occupation and one level of educational attainment limits the ability to generalize my results (that is, results and conclusions may not apply to other occupations or to other levels of educational attainment) but choosing just one occupation that has a relatively equal employment distribution between men and women, and just one education level is likely to provide the cleanest evidence or lack thereof for the wage gap. Many factors contribute to gender wage differences between men and women in the same occupation. In the end, like other researches, my analysis showed that under 10 percent of the difference between the wages and salaries of men and women (in accounting) cannot be explained by difference in hours worked, the presence of children etc. This little exercise cannot say whether those “unexplained” or unaccounted for factors mean discrimination or bias or less pernicious forces that are not captured or measured with available variables. Regardless, the results were fascinating (to me at least) for a number of economic and sociological reasons. 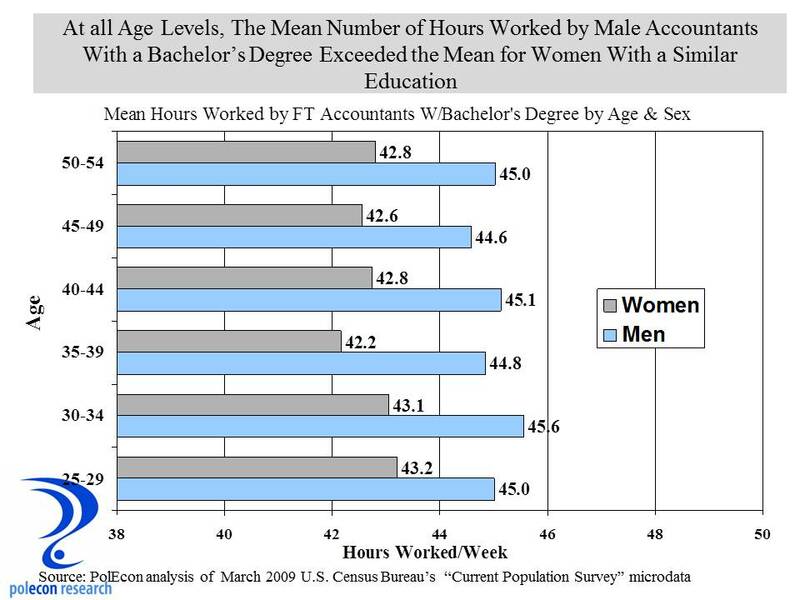 At all age levels, women in accounting worked (on average) fewer hours weekly than did men (Figure below). This was true for women with and without children and whether they were married or not. Regression models show that each additional hour worked per week actually added more to the annual wage and salary of women than to men ($641 to $568). This suggest to me that women are rewarded equally for additional labor and that some of the wage gap in accounting is simply attributable to the longer (on average) hours worked by men. Child birth and care is associated with lower labor force participation among women but on average, women in accounting worked fewer hours than did men whether or not they had children. This is not an epiphany because child care responsibilities still disproportionately fall on women. 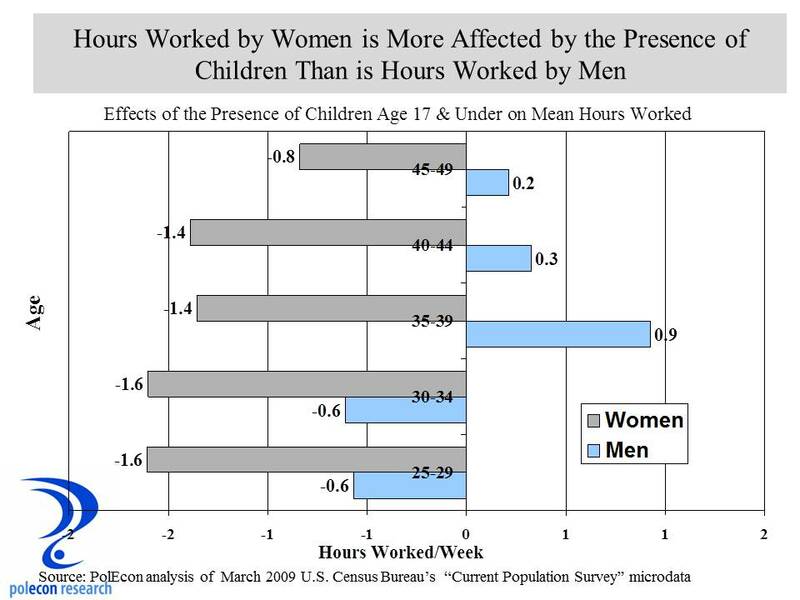 The presence of children, however, does have a much more negative impact on hours worked for women than it does for men. The effect on hours worked diminishes by age for women – presumably because children are more likely to be older and in need of less care. Interestingly, among younger men, the presence of children reduces hours worked (not as much as it does for women) but among older men, the presence of children is associated with small increases in hours worked. I hope this implies larger roles in child care among younger men that will contribute to a further narrowing of the wage gap. Wages grow with age and experience (typically for most individuals into their late fifties) but among accountants with bachelor’s degrees, they grow less, on average, annually for women than for men. The cumulative effects of hours worked, breaks in labor force participation among women for child care, and other factors can account for some of this. But key factors that can determine how much wages grow over time (getting promotions, asking for raises, motivation etc.) cannot be discerned from the data. If women aren’t promoted as readily or don’t seek raises as often or as large, their annual wage growth would be expected to be lower. The figure below shows some of the wage and salary impacts for men and women of different variables. 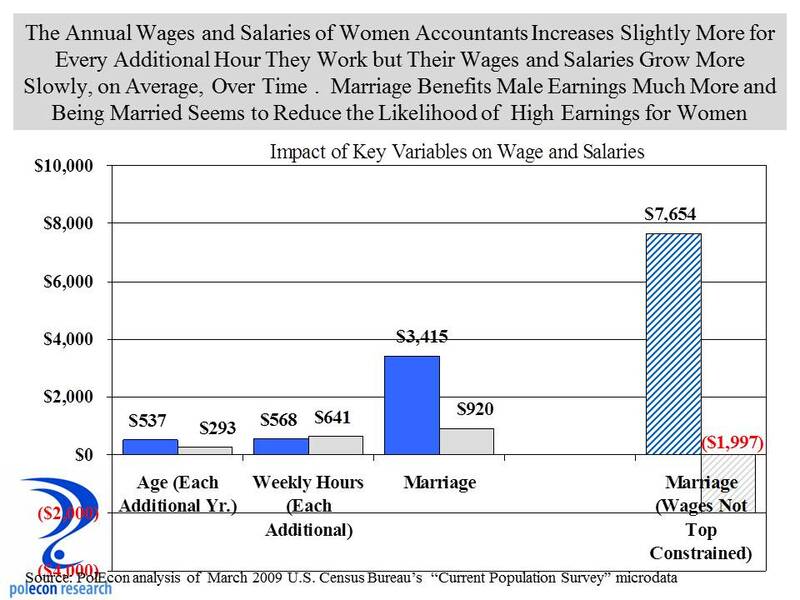 Interestingly, marriage seems to have a much more positive impact on the earnings of men than it does for women, adding $3,415 to earnings of men but just $920 for women when controlling for other variables (i.e. age and hours worked, children, etc.). Apparently some stereotypes are based in reality and it makes me wonder what aggregate economic and societal implications this may be having as more young men seem to resist or delay marriage or long-term relationships. The big take away for me was the impact that marriage as well as the “unexplained” difference attributable to gender had on wages and salaries when earnings were not “constrained,” meaning that the data included the earnings from the highest earners, the “outliers” or top 15 percent who earn much higher salaries than typically earned in the occupation. For most of my analyses I selected data for individuals whose wages and salaries were between the 15th and 85th percentile of all earners among accountants. But I also ran the same analyses using data that was not constrained at the top of the earnings scale. This would likely include business owners and individuals in higher level positions. When data was not constrained based on wages and salaries, the impact of marriage on the wages and salaries of women was significantly negative in contrast to the wage and salary constrained data where it was positive (albeit a much smaller relationship with earnings than for males). The unexplained difference attributable to gender was also disproportionately large compared to the constrained data set. What this says to me is that the largest evidence of a gender wage gap occurs at the upper end of wages and salaries and may be more attributable to lower percentages of women in higher positions (a “glass ceiling” effect) than a paycheck fairness effect. Does this mean that women are at a disadvantage in becoming high earners if they are married, and if so, is it the result of personal choices or does the labor market systemically punish them relative to men? Does being married necessarily mean that a woman will be less likely to rise to the top of their occupation? These results do suggest a glass ceiling that contributes to the wage gap and this should trouble all fathers of daughters, brothers, husbands and even friends. Unfortunately, it doesn’t say much about what we can do about it. We do have laws that prevent wage and salary discrimination based on race and gender and yet the wage gap persists (even as it has shrunk). As more women populate higher levels of occupations and organizations (it will happen as I suggest here and here and in several other posts), it is likely that whatever unexplained gender-based differences in wages and salaries (that are not based on occupation, education, experience etc.) will decline rapidly. To me, addressing why more women don’t reach higher positions in organizations is likely to be a much more effective prescription for whatever gender gap continues to exist than are mandates that seek to compensate for factors that we aren’t even sure contribute to wage and salary differentials between genders. 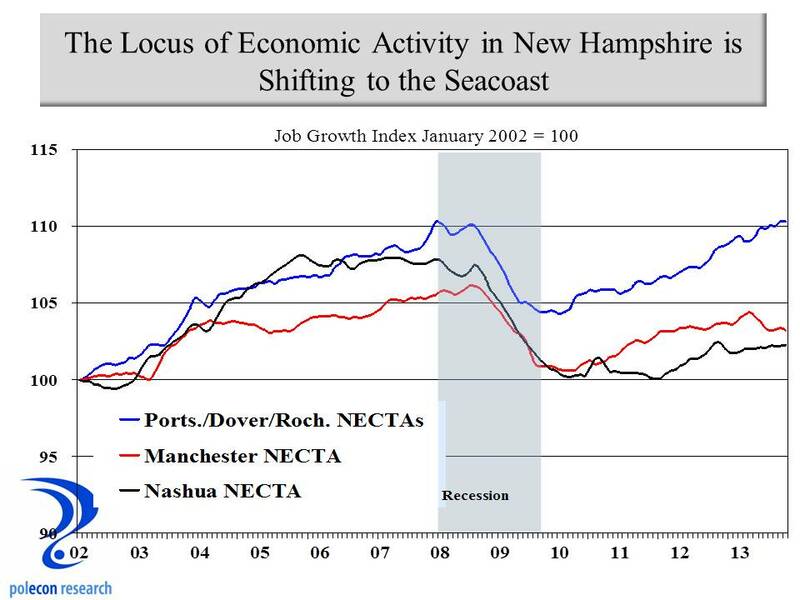 I gave a presentation last month during which I argued that the locus of economic activity in New Hampshire is shifting to the Seacoast. That is a provocative statement destined to offend the population centers of Manchester and Nashua and quite likely the individuals elected to represent them. Provocation isn’t my intent, it rarely is, but is often the result nevertheless. This shift will take years to become more apparent but the evidence for its occurrence appears across a range of important economic and demographic metrics. Over the past decade, private sector job growth in the combined Portsmouth and Dover/Rochester NECTAs** has outpaced growth in either the Manchester of Nashua NECTAs. The Seacoast is home to only about 15% of private sector employment, but that percentage is growing. The shift is not really about the job growth numbers because the Seacoast will always have smaller employment numbers than will the population centers of Manchester and Nashua. It is about how so much more of the innovation and transformation that is occurring among businesses and industries in the state’s economy is occurring in the Seacoast region. Alone, the increase in private employment in the Seacoast relative to the Manchester and Nashua regions would not be that significant. Rather, it is the increasing share of innovation and growth in key industries that the Seacoast is capturing that indicates the locus of key economic activity is shifting. As the chart below shows, the Seacoast region has marginally increased its share of New Hampshire’s private sector employment since 2004, but it has, in relatively short time, substantially increased its share of finance and insurance industry employment, information industry employment, as well as both health care and manufacturing employment. Annual town-level data stops in 2012 but with the coming addition of technology dependent, international companies like Safran, the manufacturing trend appears to be continuing. 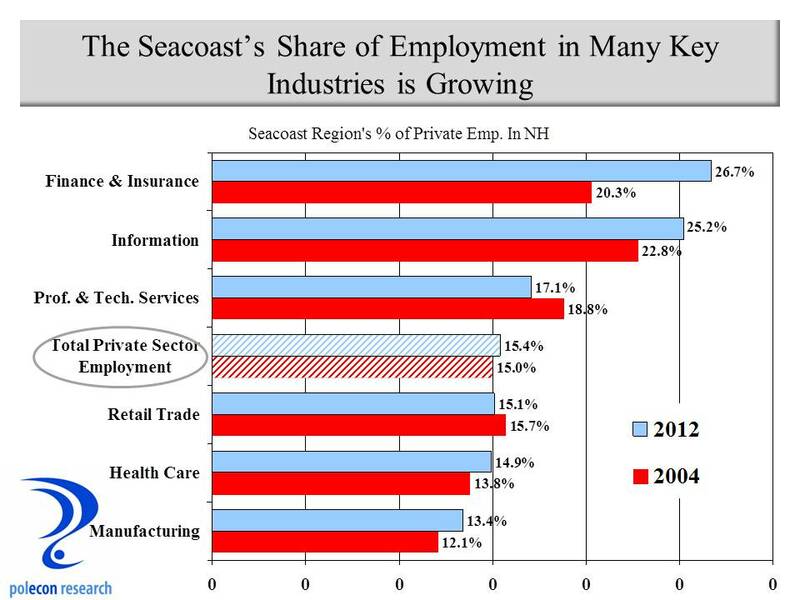 The one key industry where the Seacoast has not gained share is in professional and business services. This is a large, important, and growing sector of the New Hampshire economy. In most states, key professional and business services firms often locate in the state’s largest city. Major NH Law firms, engineering firms, advertising agencies, and many of the other industries that comprise this sector still seem to prefer to be centrally located and have their main offices in the state’s largest city, Manchester. Having a main office anywhere other than the largest city seems to signal, to some, that a business is “regional,” that it does not serve the entire state or the larger New England region. The Seacoast is also capturing a smaller share of retail employment, which is surprising given its location along two state borders. It is not that retail is declining in the region but rather that it has grown faster elsewhere in the state. Manchester and Nashua are still home to more companies in key industries than is the Seacoast and that will be true for some time, maybe always. Still, there was a time when the Greater Nashua and Manchester areas were the technology and manufacturing center of New Hampshire and almost all important developments in manufacturing and technology industries occurred there. These regions remain the technology leaders by numbers, but more key developments and new companies in technology and manufacturing are occurring in the Seacoast. The development of the Pease Tradeport into a premier location for industries of all types, along with the presence of a major research university (UNH), have played important roles in the shift. But what is really sustaining the trend is the ability of the region to attract the talent (skilled individuals with higher levels of educational attainment) that companies in emerging, growing and higher value-added industries desperately need. As I say far too often, brains are the most valuable resource in the 21st century. Skilled, well-educated people have the most economic opportunities and they are the most mobile members of society. Where they choose to locate, robust economic growth is likely to follow. Examining Census data indicates that skilled individuals with higher levels of educational attainment have increasingly chosen to live in the Seacoast, and that has provided a key source of competitive advantage to the region. 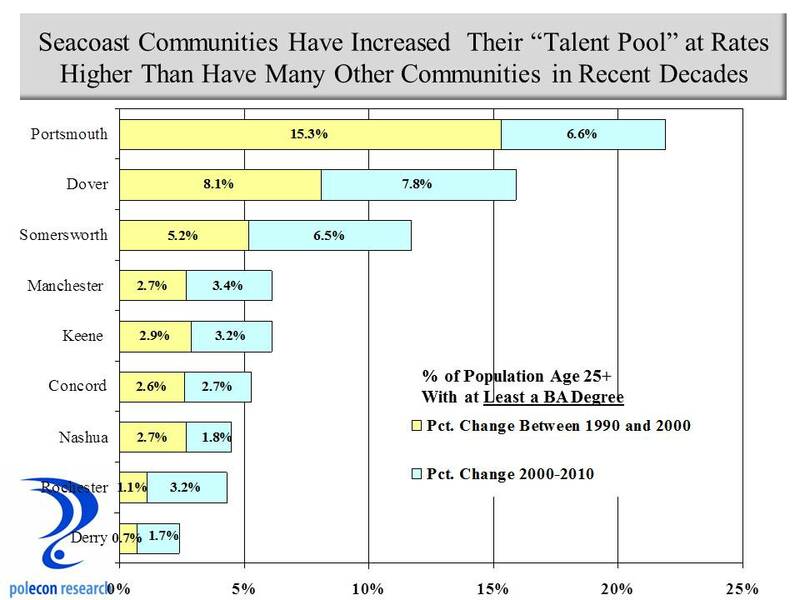 The chart below shows how the population of individuals with a bachelor’s degree or higher has changed in some NH cities over the past two decades. The chart shows that on a percentage basis, Portsmouth and Dover, by far, had the greatest increase of individuals over the age of 25 with a bachelor’s degree among their populations. Somersworth, although beginning with a lower concentration of individuals with a bachelor’s degree, had the next largest percentage increase in subsequent decades. Among the largest cities in the Seacoast, only Rochester has not seen a substantial increase in its population with a bachelor’s degree or higher. If the Seacoast continues to increase its concentration of “talent,” then the locus of economic activity in the state will continue to shift toward the region. Communities in the region continue to attract skilled individuals with higher levels of educational attainment because, to varying degrees, most have been able to provide a mix of services and social, cultural, and civic amenities, at a price more affordable than communities in other states. But if being the “cheapest” place to live were the key, the Seacoast would not be thriving. Rather, it is the combination of services and amenities at relatively more affordable price (providing a good value) that has been attractive. 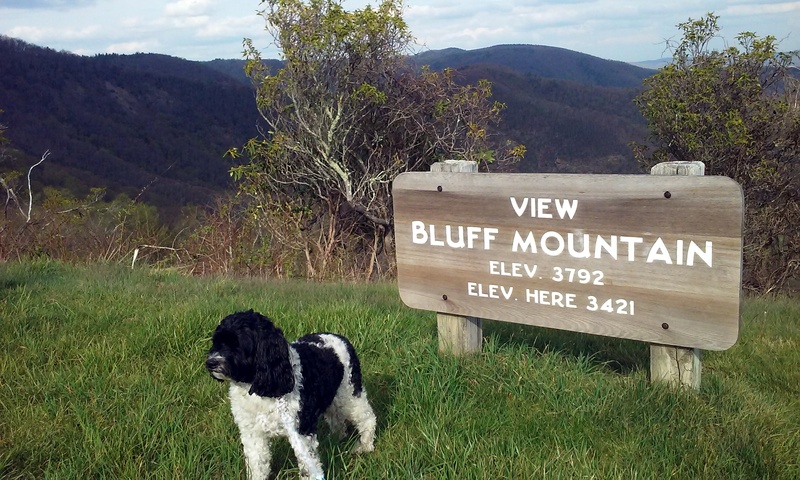 Many communities and regions are looking to thrive. Like all regions in New Hampshire the Seacoast has heard, and for the most part heeded, the call for fiscal restraint (although you can never spend too little for some or too much for others), but most of its communities have looked for ways to continue to provide or increase the quality of their services and the amenities (natural, built, civic, social and cultural) they offer. It is more difficult for urban areas to attract and retain the skilled individuals with higher levels of educational attainment that are increasingly the key to a vibrant economy because urban cities have to find ways to provide and encourage a level of services and amenities to compensate individuals for living in cities that have the problems associated with urban environments. Most of the focus of economic development strategies is on creating policies to ensure a “good business climate.” I think that is important and I also think NH has a pretty good business climate. With so much concern over population and labor force growth and demographic changes in NH, more emphasis needs to be placed on creating a good “talent climate” as well as a good business climate. I don’t know that the Seacoast of NH has sought to do that but the demographic and economic data suggest they have done so regardless. The result has been a competitive economic advantage. On a smaller and slightly different scale you can say the same thing about the Hanover/Lebanon area which serves as a nice control group to assure the importance of amenities don’t just mean having an ocean nearby. ** NECTA = New England City and Town Area, a grouping of towns into a connected labor market area, akin to a metropolitan or micropolitan statistical area. The employment growth report released today by the U.S. Bureau of Labor Statistics was disappointing for sure (74,000 job growth when 200,000 was the consensus estimate) but December employment numbers are more prone to seasonal adjustment errors because of the large amount of hiring that occurs prior to the holidays and this year presented even more issues because of the shortened time between Thanksgiving and Christmas (Thanksgiving was on the 28th, its latest possible date). December’s employment growth may still be disappointing but my bet is that December’s numbers will be revised up in future months. Help wanted ads have been increasing for the past six months and the labor supply/demand ratio has been falling. Unless there is an even bigger “skills gap” than many think, that implies stronger job growth than was reported in December. The best thing about the report was that it helps focus more attention on the nation’s incredible shrinking labor force, a problem that significantly lowers the potential economic growth of our nation’s economy. Too many media reports on the nation’s and NH’s economy focus almost entirely on the unemployment rate. That is especially true in New Hampshire where, because of our demographics (a lower percentage of harder to employ populations are in our state’s labor force), we always have a lower unemployment rate than the U.S. No matter how weak job growth is in New Hampshire, many will cite our lower than the U.S. unemployment rate as a sign of economic strength. Some reporters (hat tip to John Nolan of the Rochester Times) have avoided confusing job growth with the unemployment rate but too many in our state confuse the two. The problem of smaller or slower growing labor force is an important and vexing one for New Hampshire and the entire U.S. A smaller or slower growing labor force implies slower economic growth because the output of the economy grows when more people are producing, when more capital (equipment and machinery) allows the same number of people to produce more, or when knowledge/technology/skill levels improve and allow greater productivity per worker. So unless productivity is increasing to compensate, a shrinking or slow growth labor force means slower economic growth. There are several reasons a labor force can shrink or grow more slowly. Some related to economic conditions, some related to demographics, and some (such as the current situation) seem to have an unexplained element. Nationally, population trends have meant slower labor force growth as lower birth rates over the past few decades and as baby boomers reach ages where labor force participation starts to decline. NH benefited from strong population growth in the 70’s and especially 80’s and 90’s. That provided a strong boost to our economy, especially since much of that pop. growth was the result of in-migration from other states by skilled, well-educated individuals (a good characterization of our in-migrants from other states is a two wage earner, married couple family, probably both college educated with children). That migration added tremendous talent to our labor force and made NH an attractive location for many business looking to employ skilled workers. The labor force grows or shrinks by population growth in the working age population, or by changes in labor force participation (those of working age who choose to be in the labor market or not). NH and the U.S. have seen slower population growth in the working age pop., but more disturbingly, both have seen a decline in the labor force participation rate. 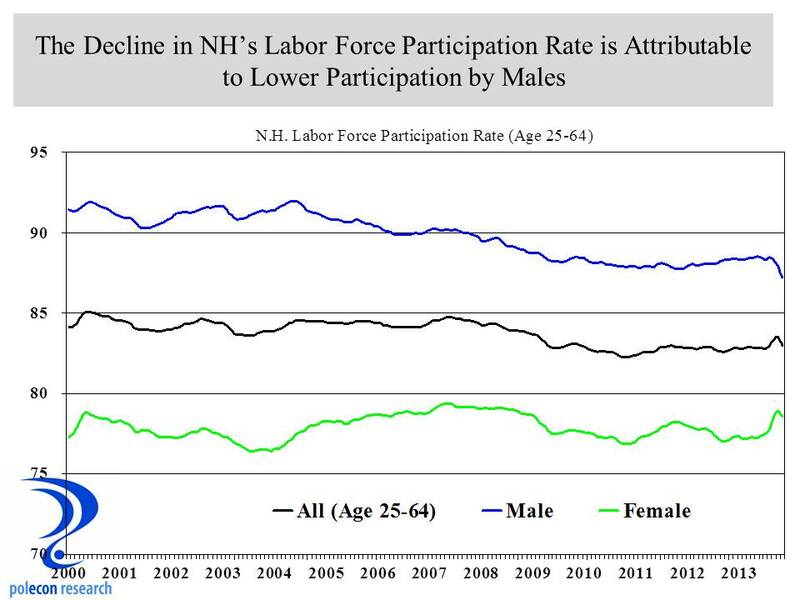 Yes NH still has a relatively higher participation rate but the trend decline is similar to the U.S. The graph below shows the decline in participation among individuals aged 25-64 (to minimize schooling and retirement decisions as possible causes). If your working age population isn’t growing, having high labor force participation rates is critical for economic growth. NH has had very high participation rates compared to the U.S. because of our favorable demographics (few people who traditionally have lower levels of participation – minorities, those without a high school diploma etc., and because our population overall has higher levels of educational attainment that is associated with labor force participation). Women in NH especially tend to have higher participation because of higher levels of education and lower fertility rates (child-bearing lowers labor force participation). 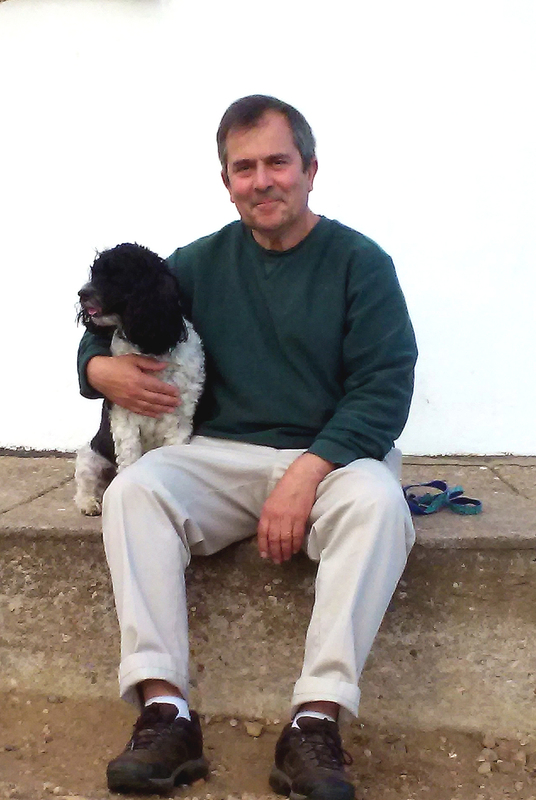 I have written many times on gender and employment (search on gender in this blog) and the “feminization of the workforce” is a theme (non-pejoratively as the father of daughters) I believe is continuing. As the chart below shows, virtually all of the decline in the labor force participation rate in NH is a result of a reduction in the rate among males. Labor force participation always drops during recessions as workers get discouraged and drop out. What is especially troubling today is that labor force participation continues to be weaker even as the economy has improved. Some has to do with demographics as more of the working age population ages into groups with lower participation rates although participation among those with higher levels of educational attainment seems to have held-up best. The best explanation of why labor force participation has continued to be lower than in the past is that the skills required by the economy have been changing, making many workers less qualified than before and creating more discouraged workers. I think that is part of the issue but I don’t think the “skills gap” could have so abruptly hit the labor market to cause participation rates to fall so much over the last half-decade. The skills gap has been a more slowly growing phenomenon. Among older men without a post-secondary degree, participation has been declining for decades. The skills mismatch between the supply of labor among males and the demand has been ongoing for decades. Did it peak so suddenly in the past decade to create a permanent decline in the male workforce? I don’t think so, additional factors are contributing. I remember in the 70’s when the first real oil crises hit (related to Middle East wars) and a lot of job losses resulted, especially in mill towns like the one I festered in as a youth. Someone whom I thought was wrong about almost everything said to me at that time “a man should never be ashamed of any job he takes to feed his family.” I didn’t think much about that back then, but today it seems especially appropriate, even as it appears to be increasingly a relic of an outdated ethic. Economic conditions today aren’t the result of people not wanting to work and a labor market where many individuals are working at jobs that don’t fully utilize their skills is not desirable. Changes in and the performance of the economy are obviously largely responsible for declining labor force participation. Still, with so many troubling indicators for males – especially younger males (educational performance and attainment, household formations etc.) emerging over the past decade or more , I can’t help wonder how much of the decline is the result of a lost ethic among my gender.